Tips on where to see puffins in Scotland. (Sometimes they aren't as easy to spot as you might think.) Also how to behave before a puffin - plus a plug for other auks, who get jealous of their cute cousin. NB puffins may look comical but this does not mean they have a sense of humour. You’d like to know where to see puffins in Scotland? But you’re not an especially avid birdwatcher? Admit it, you just like puffins? That’s fine - a lot of visitors to Scotland are like you. If I told you I could show you what are probably Scotland’s most northerly pair of breeding yellow wagtails you’d probably feign vague but polite interest. But if I mention puffins I see you’re already reaching for the camera and making drooly noises. What is it about puffins? Oh - and I will also suggest some good places to stay while you go on your puffin-tour! OK, I’ll tell you where to see puffins in a minute. (Or, at least, I’ll point you towards some puffiny places.) First I want to make a plea for their cousins, the rest of the auk tribe. Auks are a kind of seabird of roughly small penguin shape, usually black and white. On the other side of the Atlantic from Scotland, they are called murres, a name you never hear here. (Pictured here) Some places to see puffins in Scotland. Obviously I can’t put in every cliff-face. It’s just a sample really. There are lots more Scottish puffin locations. Anyway, we call the most common species of auk a guillemot, the name deriving from a diminutive version of the French name Guillaume (William). And the thing to remember about guillemots, the puffin’s cousin, is that they are really jealous of their colourfully-beaked cousin. Why? Because – and I’ve seen it myself so often – picture this scene. There’s the visitor. In front of them is a cliff, covered, stacked, thronged with guillemots (and razorbills), all braying and pecking and shuffling in the confined ledges. At that point the visitor will say ‘So where are the puffins?’ Small wonder the guillemots get jealous. There they are, all these auks, doing their best to be entertaining – and all you want to see is the guy with that strap-on stupid beak? One other point about puffins. They are considered to be so cute that they have their own cutesy kind of vocabulary. Baby puffins are, apparently, pufflings. Puffins live in puffineries. Puffins in captivity are kept in puffinariums. Only joking about the last one. But feel free to make up your own puffin-speak. I know I intend to. You think you know what a puffin looks like? Well, of course you do if the little beast wanders up to you and looks cute. It’s that beak, plus the eye make-up. And, yes, they are surprisingly tame when you get close. Black guillemot in Stromness harbour, Orkney. (Pictured here) This is not a puffin. It’s a black guillemot. Sometimes called a tystie. This one’s just caught a fish. Tysties are inconspicuous and tend to be in small groups. They nest in screes and rocky places. Nobody ever drooled over a black guillemot, but I like ’em. So, if you are on, say, the top of a cliff and there are auks whirring around in all directions below you, I’d say you’ll recognize a fly-by puffin by the orange legs ahead of the beak. No, I don’t mean it flies feet first, I just mean the orange is surprisingly conspicuous. The legs stick out like brake-lights. Same applies if you are casually puffin-spotting from the rail of, say, a CalMac or Northlink ferry. This is a fine way of spending part of a sea-passage in Scotland. Just scan these auks pattering away from the bow-wash. Very occasionally one of these unutterably tedious (apparently) guillemots will turn out to be an absolutely charming and captivating puffin. You will need a decent pair of binoculars, of course. Check them out on that Amazon link. The fact that you've spotted a few puffins will give you moderate bragging rights when you go back into the lounge, though not as much as casually remarking that you’d seen dolphin or killer whale. Anyway, back in puffin world, yes, keep an eye on auks on the water. Keep those binoculars handy, of course, and, yes again, on the water you obviously can’t see the feet so look for the beak and head. Just now and again you’ll spot one or two. They’re a very sociable lot, the other auks like guillemots and razorbills, pictured here. (Oh, wait. I think I've cropped out the razorbills.) In comparison, puffins are a little stand-offish. Anyway, these other auks are comfortable in big numbers, nesting side by side on these shelves and ledges, sometimes also in company with that sea-going delicate-looking gull, the kittiwake. The kittiwake is easily recognised by…oh, never mind, let’s stick with those dang puffins. Typical puffin habitat. Grassy, steep and riddled with burrows. This is actually at Hermaness, Shetland. Your cuddly friends with the clown-face prefer to keep their domestic affairs out of sight. They nest in burrows. So there’s no point in scanning the vertical rock-faces where they’d need little puffinous pick-axes to make holes in the first place. Look for puffins in Scotland on steep grassy cliffs, or those parts of cliffs with scree or, in general, where it’s that bit greener (indicating soil rather than bare rock). Sure, they’ll pose about on rocks but, in the main, they’re usually a little aside from the main throng and nearly always in smaller numbers. Early in the season they come in off the sea and hang about, just off their breeding colonies. Sometimes they wheel around in great flocks. Then they get down to the serious business of decorating their burrows with a single large egg. Puffins respond to increasing light levels and put on their breeding dress - they’re much more drab out at sea in the winter. In Iceland, where they still hunt puffins (no comment necessary), they splash orange paint on the rocks and and wear orange clothes as puffins are attracted to orange. (Personally, I’m attracted to banana.) Maybe you photographers want to try that if you want real close-ups? OK, I know enough now about how to recognize a puffin. Please stop doing a plug for other auks in general and tell me where in Scotland I should go? 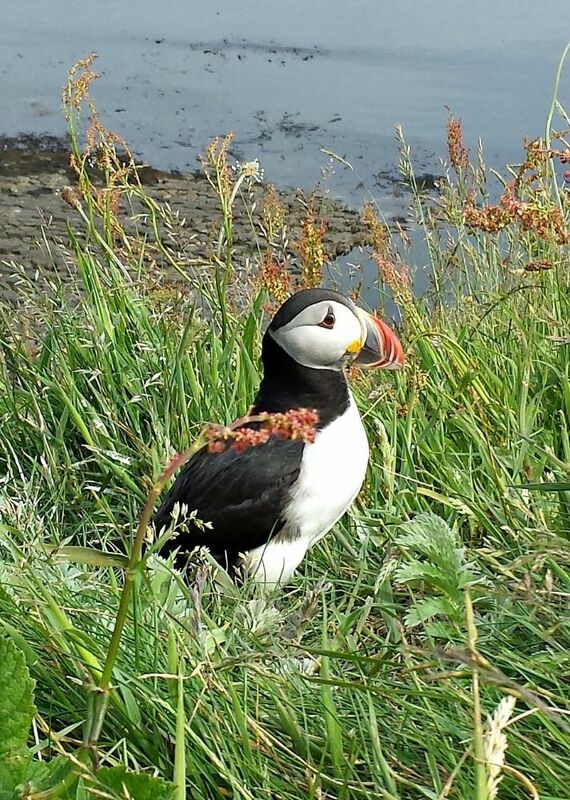 Where to see puffins in Scotland. Puffinaceous encounters take two forms here. The first kind is when you see them through binoculars from above and if you were to get any closer you would kill yourself by falling a very long way into the sea. Puffins don’t live in parks. The second kind of experience, much sought after by puffinaphiliacs, is where you can, literally, stroll up to the birds. Obviously, the terrain will be gentler but you can be sure that somewhere close by will be the vertiginous plunge to your doom, so take care, will you? Puffins are always to be found close to or on the sea. Most importantly, though you may hear puffins give a kind of deep yet nervous laugh, this does not give them a sense of humour. Being a puffin in Scotland is probably a deadly serious business, what with the sandeel shortages and all that burrowing playing havoc with the plumage in the breeding season. The most important thing to remember during your potentially rewarding puffinesque encounters is that while you might be thrilled to see them, the feeling is unlikely to be reciprocated, clown outfit or not. The most you can hope for is a kind of fishy indifference. So, give them space, don’t get in the way and don’t fall off the edge. (Pictured here) Puffin on the island of Staffa. While the rest of the group were looking at the basalt columns, Johanna went off looking for puffins. And found some. All right. Here we go. If crossing north over the Scottish Border on the east side, then St Abb’s Head is just a few minutes away. Eyemouth and St Abbs are signposted from the main A1. In Eyemouth, you could rent Puffin House or stay at The Home Arms Guest House. Then, carrying on up the east coast, for high-profile visitor haunts, there is a bit of a gap. There are some puffins about wherever there are suitable nesting habitats as described – for instance at Fowlsheugh (RSPB Reserve) below Stonehaven and also the cliffs by Muchalls, above Stonehaven – just two more slightly puffinous places on this east coast stretch. Then it’s round and into the Moray Firth, where there are also a few at Troup Head (RSPB Reserve and boyhood haunt) though everyone associates this place with gannets these days. To be honest – and this is as much to do with geology as anything else – it isn’t until you are seriously up north that you get into a few ‘stroll up to them and snap a cutesy picture’ situations. For example, if you head north to Caithness and park at Duncansby Head Lighthouse and walk south to get the standard pictures of the Stacks of Duncansby, then there are puffins on the grassy sections of the cliffs en route. Puffins are something of a birdy speciality on the Northern Isles. There they are called ‘tammy norries’ – a word, may I say, that I have only ever read in tourist guides and, for all I know, could originally have been invented by a guidebook writer and been repeated ever since. Anyway, puffinoidal hotspots in Orkney include, Westray, Papa Westray and Copinsay, plus a few at Marwick Head. Shetland is also extremely puffinized. I’ve seen great views of them at Sumburgh Head – just look over the wall of the road up to the lighthouse (the ultimate in easy puffin-ogling, I would say). (Pictured here) Tentative puffin sketch, done while hanging over the edge of this huge precipice…you don’t believe that bit, do you? Several places on the western seaboard are also puffin hotspots. The general rule is that if it is an island that is isolated and sometimes hard to get to, then the chances are it’ll have huge numbers of puffins. The island of Handa, north of Lochinver, however, is fairly easily accessible and includes puffins on its birdy menu. The Shiants out in the Minch and also the Treshnish Isles are well known. The puffin pictures here were captured by Johanna on Staffa, an island more associated with Fingal’s Cave. And do you know, she just took these with her phone? I was outraged. Why can’t she use a proper heavy cumbersome photography-martyr’s camera like I do, for goodness sake? For Staffa, the Isle of Mull is a good base to stay. Best Time to See Puffins? So, to conclude, I’d say it should be straightforward to nail your puffins, so long as you come between, say, April - but not too early - and August. You won’t find any outside that time frame. And don’t get too hung up on just puffins. There’s a lot of other interesting stuff going on along the seaboard. You might even get to like guillemots. And, as I see you are still reading, then here are plenty of puffinous facts - just so you can be totally auk-aware! * Puffins lay a single egg only a little under one fifth of their own body weight. *Male and female puffins look more or less identical, (except to other puffins, presumably) but wear their clown gear only for the breeding season. *They don’t breed until they are at least four, sometimes older and very often return to the site where they were born. *Researchers say that the ‘divorce rate’ amongst puffins is between 7-13% - so that’s nice for them. You can easily imagine these long-established couples bickering in their burrows over whose turn it is for the fishing trip. *They oldest puffin ringed by scientists - and whose ring was found - was over 30 years old. It’s possible that puffins live even longer than that. While feeding up their chick from 2 oz (57g) at birth to 12 oz (340g) a month later, puffins rack up some pretty impressive sea-going statistics. Each parent at sea may dive between 600 and 1150 times daily for the sandeel or sprats or capelin. Anyway, many of these dives are less than 50 ft (15m). Some are as deep as 200ft (61m) and last two minutes. The average time a puffin spends underwater during the breeding season is about seven hours. Total commuting team from burrow to fishing ground and back may be as much as an hour and a half. In short, I would not advise coming back as a puffin for your next life. Oh, and the average puffin catches 450 sandeels per day. It’s a wonder they have any time at all to stand around and pose for your enjoyment. Unlike their cousins, the guillemots and razorbills, who positively entice their chicks to leave the nesting ledge, puffins are much more wings-off about their youngsters. They feed them up to give them fat reserves and then leave them to it. When the time is right, like independently minded teenagers, the young set off at night from their home-burrow, ignored by their parents. They leave the burrow for good, heading out to start their sea-going lives. I got some of these statistics from a book called The Seabird’s Cry, by Adam Nicholson. It’s got a ton of research data all packaged in a froth of high-flown poetic and indulgent similes. You’ll either love this or just want to slap the author. I’m undecided. Sadly, one auk you won’t see is the Great Auk. The last one recorded in Scottish waters was actually presented alive in 1821 to Robert Stevenson by a local crofter while Stevenson was inspecting the Eilean Glas lighthouse on Scalpay, which is just off the larger island of Harris in the Outer Hebrides. Anyway, the bird joined them on the inspection voyage, being allowed to swim and feed via a string on its leg. At voyage end, before it was donated as a specimen to the Museum at Edinburgh University, it was given one last swim. By this time the inspection yacht was in the Firth of Clyde. But the string snapped, the bird swam away and was never seen again. The last encounter with a breeding pair was in 1844 on Eldey, off south-west Iceland. Both birds were strangled, their egg smashed. The last ever sighting was in 1852. Then the great auk was gone for ever. Flightless, this penguin-like Northern Hemisphere bird was ruthlessly exploited for food and persecuted to extinction. Museum demand for skins also hastened the end of the species. See, I told you being an auk, even a puffin, is a serious business. …ever wondered why puffins and other auks flap their wings so fast? Now sit up at the back and pay attention. Let’s talk about wing-loading factor. Puffins and auks have a special problem. They need wings both to fly and to swim with. So they’ve had to compromise. No point in having great long soaring wings like a gull. (Low wing loading factor.) Hopeless under water. But no point in having wings that are really so small that you can only use them as flippers, otherwise you’d end up like the great auk – and we all know what happened to him. So, auks and puffins have a high wing-loading factor – little wings useful for swimming but you have to work them hard to get airborne. That’s why puffins flap more or less constantly while flying. No effortless gliding for them. For my next life, I’m definitely not coming back as a puffin. Sounds like a lot of hard work.